I have never been very good at boiling corn. I can never remember how long to cook it, and even different tricks like adding salt to the water, adding sugar instead of salt, boiling the water first and then adding the corn…none of them ever worked consistently for me. So I just grill it. Right in the husk. It’s fast, it’s easy, and as long as I don’t get distracted, it almost always turns out perfect. 1) Start with super fresh corn. 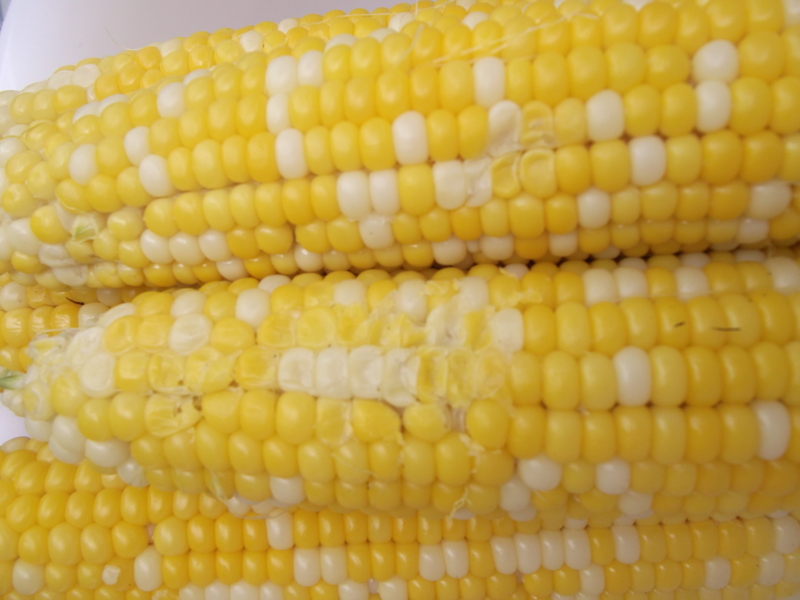 From the moment corn is picked, the sugars in the corn start turning to starch, so the quicker you can eat it, the sweeter it will be. Keeping it refrigerated will slow this process and buy you a little more time, but try to cook it as soon as you can for optimal flavor and texture. 2) Fire up the grill: turn the burners on high and heat to about 400-450 degrees. 3) Peel off only the loosest outer leaves and snip the silk off the top. These bits are likely to catch on fire and make a big mess. Don’t peel too much off, though: it should look like the neatly manicured ear on the bottom. 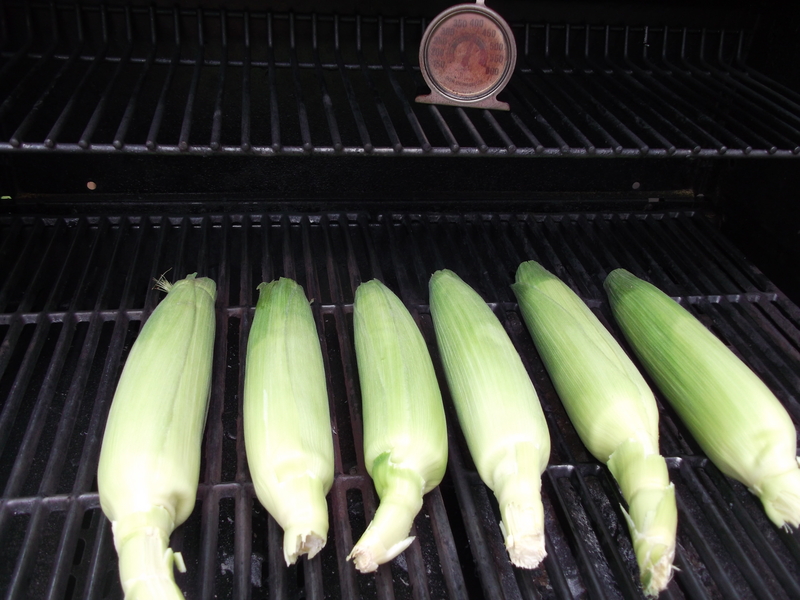 Optional: Soak the trimmed cobs in water, keeping them completely submerged, for about 10-15 minutes. This will add some moisture that will keep the husks from scorching and will help to steam the corn. I call this step “optional” because I don’t always do it and my corn still turns out fine, especially if the corn is really fresh and hasn’t had a chance to dry out. 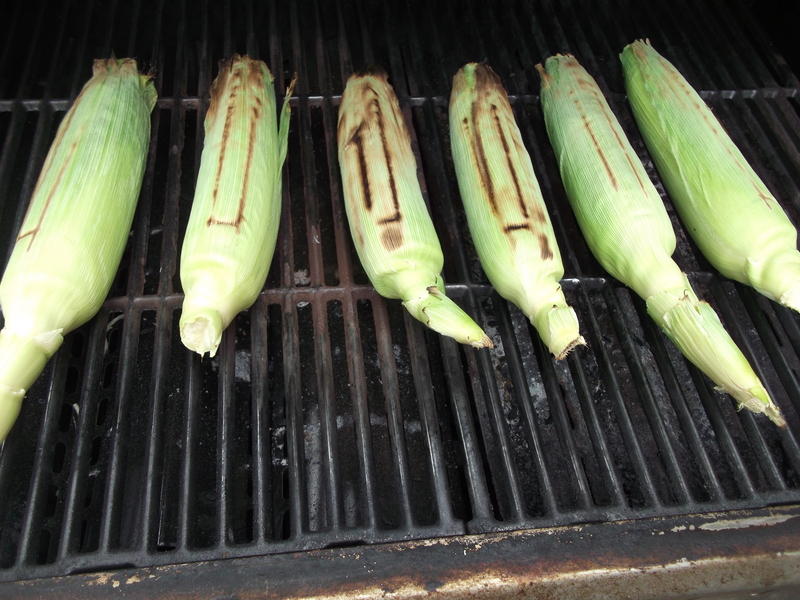 4) Place the corn on the grill, directly over the flame. Close the grill and grill for two minutes. If you are prone to distraction like I am, set a timer. 5) After two minutes, rotate each ear upside down, so the top side cooks next. Again, close the grill and cook for two minutes. 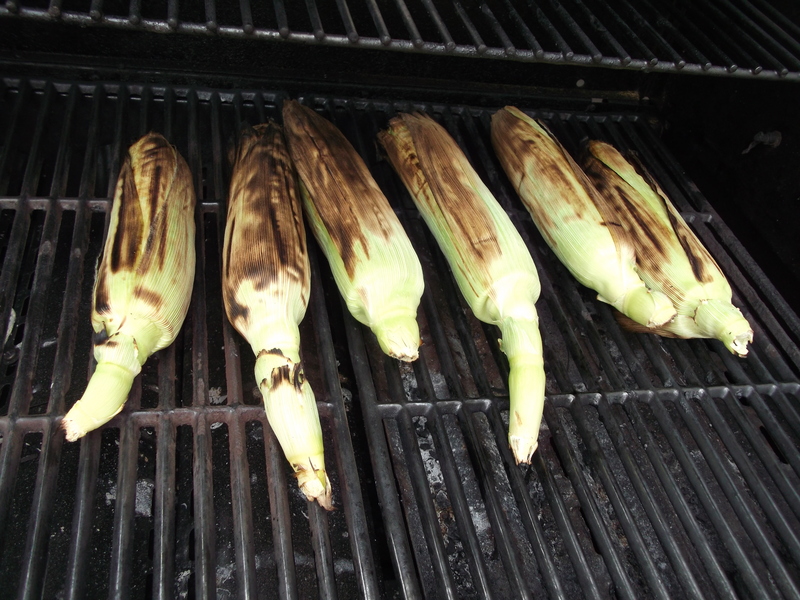 If some ears appear more charred than others, you’ll know that some parts of your grill are hotter than others. 6) After two minutes, rotate each ear onto its side. It doesn’t matter which side; you’ll get the other side next. Grill for two minutes. If some ears are getting blacker than others, move them to other places on the grill or turn the heat up or down on those areas. 7) After two minutes, rotate each ear onto its other side. Grill for two minutes. 8) The final two minutes or so are for touch-up: if an ear is evenly browned/charred on all sides and parts of the ear, it can be removed. If there are still some lighter or green areas, place those over the heat to get a little more color. 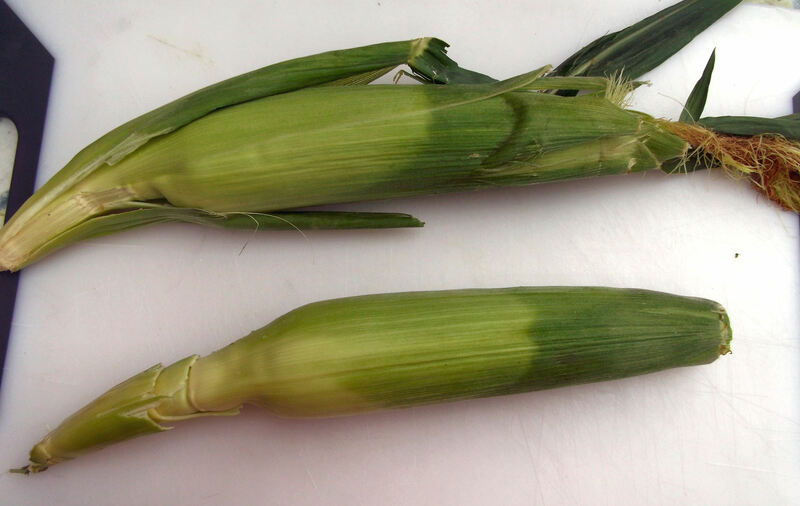 9) When removing the corn, use oven mitts and try to pick it up by the bottom stem. 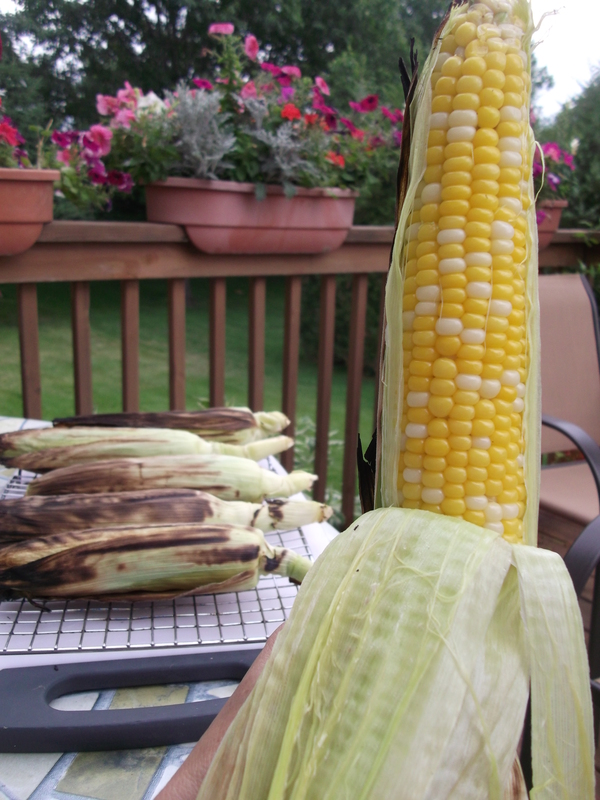 Otherwise, hold each ear gently with the mitts, but don’t use tongs: pretty much any pressure on the hot corn will easily mash it (shown here). 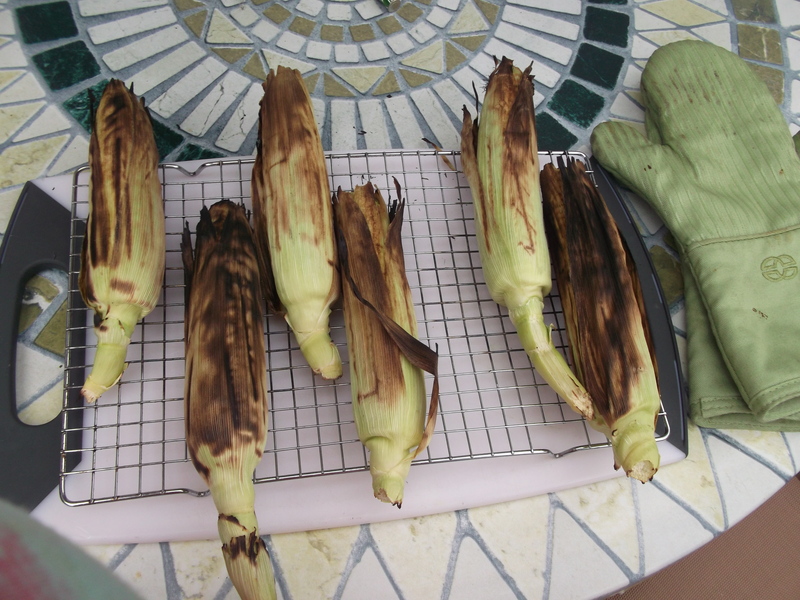 10) Allow the corn to cool for about 10 minutes before peeling. If possible, place it on a cooling rack so a little air can get underneath. You can even rotate them once or twice while you wait, to help cool more evenly and so the corn isn’t sitting only on one side. See above, about the corn getting mashed. Even resting on its own weight can do that. 11) Peel and eat. The steamed silk will peel right off along with the husk. Enjoy!